William George Blake, known as George, was born in Yeovil in 1899, the youngest of the ten children of leather slaker Elias Blake (b 1860) and his wife Sarah née Swaffield (1861-1905). In the 1901 census the family were living at 1 Smith's Terrace, New Town. George's mother died in 1905 and in the 1911 census George was living at Smith's Terrace with his widowed father and five siblings. George was listed as a scholar. It is not known when George enlisted in the Army, but he is known to have enlisted at Taunton in the 5th (Prince of Wales') Battalion (Territorials), Devonshire Regiment. (Service No 143858). When war broke out in 1914 the Devonshire Regiment consisted of two regular battalions, a Special Reserve Battalion and four Territorial battalions. By the end of the war the total was twenty-nine. It is not likely that George enlisted before 1917 since the 5th Battalion was in Lahore, India, until April 1917 when it landed at Suez, Egypt. On 25 June 1917 the Battalion transferred to 232nd Brigade, 75th Division and it is most likely that George enlisted around this time. George is known to have been part of the Egyptian Expeditionary Force (EEF) - a British Army formation, formed on 10 March 1916 under the command of General Archibald Murray from the Mediterranean Expeditionary Force, and the Force in Egypt (1914–1915) at the beginning of the Sinai and Palestine Campain. The EEF was formed in the British protectorate of the Sultanate of Egypt, the initially small force was raised to guard the Suez Canal and Egypt. During April to October 1917, Murray consolidated the EEF's position and in June General Edmund Allenby took command and began preparations to take the offensive. On 31 October two corps captured Beersheba defended by the Turkish III Corps which weakened their defences. Subsequently the Battle of Tel el Khuweilfe, the Third Battle of Gaza and the Battle of Hareira and Sheria forced the withdrawal from Gaza on the night of 6/7 November at the beginning of the pursuit to Jerusalem. During the subsequent operations, about fifty miles (80 km) of formerly Turkish territory, was captured as a result of the EEF victories at the Battle of Mughar Ridge, fought between 10 and 14 November, and the Battle of Jerusalem fought between 17 November and 30 December. The Battle of Nabi Samwil, (17–24 November 1917), was fought during the decisive British Empire victory at the Battle of Jerusalem between the forces of the Egyptian Expeditionary Force and the Ottoman Empire's Yildirim Army Group during the Sinai and Palestine Campaign, The battle of Nabi Samwil, was the first attempt by the forces of the British Empire to capture Jerusalem. The village of Nabi Samwil was part of the Ottoman defences in front of Jerusalem and its capture was considered vital to the eventual capture of the city. The British attacking force consisted of three divisions, two infantry and one mounted. The village was captured by the 234th Brigade, part of the 75th Division, on 21 November 1917, however the still had to defend it against almost Ottoman counter-attacks almost every day. Unsupported by their heavy weapons the British infantry could not break through the main Ottoman defensive line and the attack failed to reach its objective Jerusalem. 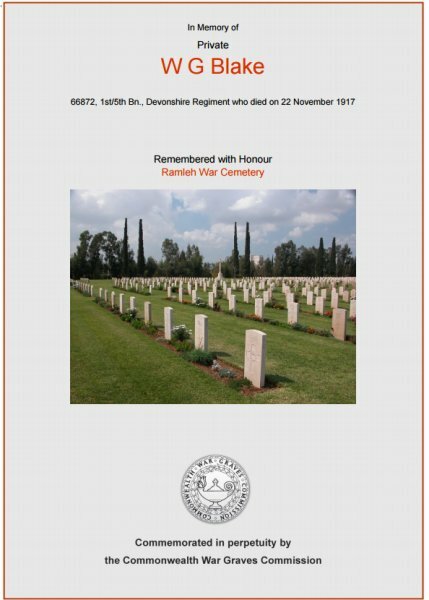 George Blake died on 22 November 1917 from his wounds received during the the Battle of Nabi Samwil (20-24 November 1917). He was just 18 years old. His name is recorded on the War Memorial in the Borough - albeit as Blake, GW rather than the correct Blake, WG.. The Commonwealth War Graves Commission's certificate in memory of William George Blake.